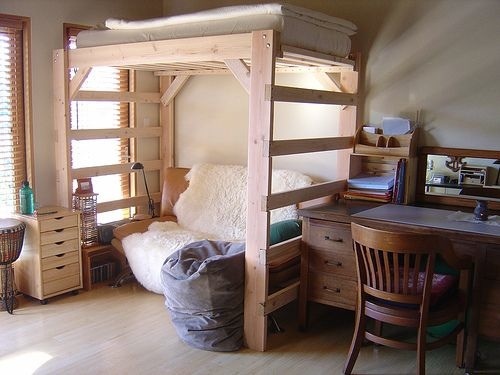 A cool sample loft bed for your dorm room. 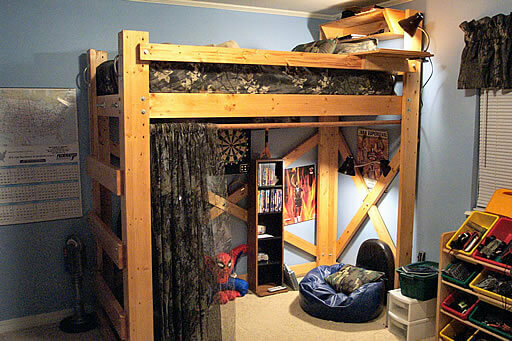 Sample loft bed for your dorm room. Let’s face it…dorm life is a sweet and sour experience that, if missed, is well, missed. Aside from the unknowns of roommates, privacy, and noise control, we do have the ability to add sugar to the situation and design a dorm room to accommodate most of our needs. One being, ironically, to increase the space of a very small space. The average square footage of a college dormitory is approximately 12′ x 19′, and with two people, that’s pretty tight. Solution? Create a loft for your bed to increase the space for a study or sitting area. Sweet. Follow these straight forward instructions, courtesy of eHow, along with our DiggersList “Things You’ll Need Listings” for discounts on supplies. Grab a buddy, or invite your parents for a DIY visit to your school, and have “lofts of fun” with this project. Click in here for full instructions. There are lots of version you can build. This is a sample for your little ones…pre-college days. This post contains affiliate links to the tools and supplies we used in this project. This means we will receive a percentage of the sale if you make a purchase using these links.